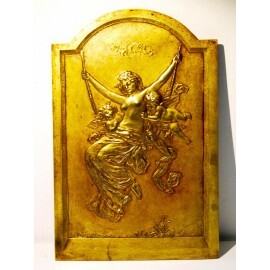 Antiques bronze bas-relief, art nouveau, early 20th century (1900-1915) half-naked woman in the swing next to two angels, signed at base Desiré Cam in the lower right corner. Original bronze patina, good condition. MEASURES: 31.5 x 21 x 0.3 cm.